The life history of A. apollinus is discussed and illustrated at length by Higgins (1975), De Freina (1985), Carbonell (1991), Hensle (1993), Nardelli (1993), Hesselbarth et al. (1995), and Löbel and Drechsel (1996). Genitalia of A. apollinus have been illustrated by Higgins (1975). De Freina (1985) and Hesselbarth et al. 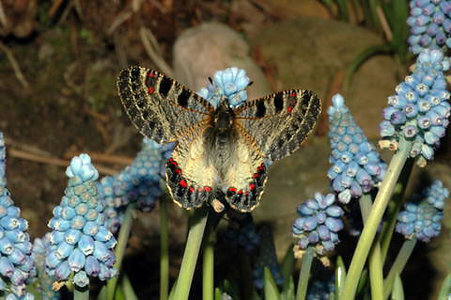 (1995) present discussions on the taxonomy and subspecies of A. apollinus, synonymizing most of the subspecies described for A. apollinus with the nominal subspecies, and distinguishing A. apollinaris as a separate species. Köstler and Abajiev (1998) discuss the origin of the Greek population of A. apollinus and conclude that it was introduced from Turkey during World War I.
Archon apollinus is distributed in Greece, Turkey, Iraq, Syria, Jordan, Israel and Lebanon, with roughly four or five subspecies (Hesselbarth et al., 1995). 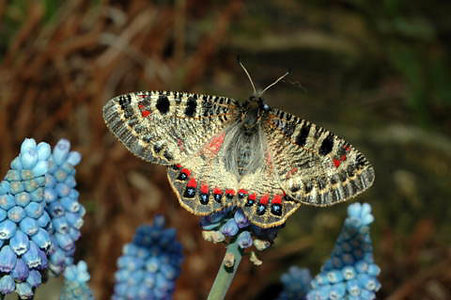 Archon apollinus previously recorded from Bulgaria, has been excluded from the list of Bulgarian butterflies (Abajiev, 1992). More specific localities are compiled in books on butterflies of Turkey (Hesselbarth et al., 1995), Greece (Pamperis, 1997), Lebanon (Larsen, 1974) and Israel (Benyamini, 2002). It is protected by law in Greece (Pamparis, 1997). The proposed reclassification of subspecies of A. apollinus by De Freina (1985) has generally been accepted (see Hesselbarth et al., 1995). Based on characters primarily from genitalia as well as life history, De Freina synonymized nearly all known subspecific names for Turkish and Greek populations proposed before 1985 with the nominal A. apollinus (Type locality: Izmir, Turkey), some of which include A. a. amasina Staudinger, 1901 (Type locality: Amasya, N. Turkey), A. a. thracica Buresch, 1915 (Type locality: Kuru Dagi, Turkey), A. a. armeniaca Sheljuzhko, 1925 (Type locality: Akbunuz, NE. Turkey), A. a. wyatti Koçak, 1976 (Type locality: Isparta, SW Turkey), A. a. wageneri Koçak, 1976 (Type locality: Marash, S. Turkey), A. a. annii Ondrias et al., 1979 (Type locality: Greece), A. a. bellargus Staudinger, 1892 (Type locality: Kassab, Syria), and A. a. lichyi Carbonell and Brevignon, 1983 (Type locality: N. Ulukisla, Konya, S. Turkey). Carbonell (1991) treated A. a. amasina from the Anatolian plateau as a valid subspecies. In Turkey, two other subspecies, namely A. a. forsteri Koçak, 1977 (Type locality: Kastamonu, Turkey) and A. a. nikodemusi Stüning and Wagener, 1989 (Type locality: Ambarli, Istanbul, Turkey), are recognized as valid subspecies by Hesselbarth et al. (1995). The latest described subspecies is A. a. drusica De Freina and Leestmans, 2003 (Type locality: Djebel ed Drùz, Shaqqa, Syria). Larvae of A. apollinus feed on species of Aristolochia (Aristolochiaceae). At least 11 species of Aristolochia are recorded, including A. paecilantha [= A. scabridula] (Larsen, 1974), A. parvifolia, A. bodamae (Buresch, 1915; Koçak, 1977, 1982), A. hirta, A. bottae, A. auricularia (Koçak, 1982), A. rotunda, A. sempervirens, A. maurorum, and A. billardieri (De Freina, 1985). A. clematis previously published as a food plant for Archon apollinus (Bryk, 1934) is probably an erroneous record as it is very toxic and larvae fed by this plant in lab condition die in a few days (Carbonell, unpublished). Abadjiev, S., 1992. Butterflies of Bulgaria. Part I. Papilionidae and Pieridae. Veren Publishers, Sofia. 91 pp. Benyamini, D., 2002. A Field Guide to the Butterflies of Israel; Including Butterflies of Mt. Hermon, Siani and Jordan. Revised 5th edition. Jerusalem; Keter Publishing House Ltd. 248 pp. Buresch, I., 1915. Über die biologie von Doritis apollinus und seine verbreitung auf der Balkanhalbinsel. Spis. Bulg. Akad. Nauk. (Sophia), 12: 15-36. Carbonell, F., 1991. Contribution à la connaissance du genre Archon Hübner 1822: Découverte de zones de sympatrie pour Archon apollinus (Herbst) et A. apollinaris Staudinger (Lepidoptera: Papilionidae). Linneana Belgica 13: 3-12. Carbonell, F., Brevignon, C., 1983. Une nouvelle sous-espèce d’Archon apollinus de Turquie. Alexanor 12: 339-343. De Freina, J.J., Leestmans, R., 2003. Une nouvelle sous-espece melanisante d'Archon apollinus (Herbst, 1789) dans le Sud syrien et donnees sur la repartition generale des taxa du genre Archon Huebner, 1822 (Lepidoptera: Papilionidae, Parnassiini). Linneana Belgica 19: 21-34. Hensle, J., 1993. Beobachtungen bei westanatolischen Osterluzeifaltern (Lepidoptera: Papilionidae). Nachrichten entomologische Vereins Apollo Frankfurt/Main, 14: 289-299. Koçak, A.Ö., 1977. New Lepidoptera from Turkey IV. Description of new subspecies of Archon apollinus (Herbst, 1789 [sic]) (Parnassiinae). Nachrbl. Bayer. Ent. 26: 54-60. Koçak, A.Ö., 1982. Notes on Archon apollinus (Herbst, 1798) (Papilionidae, Lepidoptera). Priamus, 2: 44-64. Köstler, W., Abadjiev, S., 1998. Die wahrscheindliche Entstehung einer Population von Archon apollinus (Herbst 1798) in Griechenland (Lepidoptera: Papilionidae). Galathea 14: 153-158. Larsen, T.B., 1974. Butterflies of Lebanon. National Council of Scientific Research, Beirut. 225 pp. Löbel, H., Drechsel, T., 1996. Die osterluzeifalter der Gattung Allancastria (Allancastria cerisyiGodart, 1824 und Allancastria deyrollei Oberthür, 1869) sowie Archon apollinus (Herbst, 1798) als charakteristiche kulturfolger extensiver landwirtschaft in der Türkei: Freilandbeobachtungen der raupen und falter (Lepidoptera, Papilionidae). Mitt. Thür. Entomogenverband e.V. 3: 4-7. Ondrias, J., Koutsaftikis, A., abd Douma-Petridou, E., 1979. Étude relative aux parties génitals des Lépidoptères provenant le differentes régions de Grèce. I. Papilionidae. Linneana Belgica 7: 358-362. Page: Tree of Life Archon apollinus (Herbst, 1789). Authored by Vazrick Nazari and Frédéric Carbonell. The TEXT of this page is licensed under the Creative Commons Attribution License - Version 3.0. Note that images and other media featured on this page are each governed by their own license, and they may or may not be available for reuse. Click on an image or a media link to access the media data window, which provides the relevant licensing information. For the general terms and conditions of ToL material reuse and redistribution, please see the Tree of Life Copyright Policies.